This top-quality cable allows a monitor with DVI input to be connected to a PC with HDMI output, or vice-versa. This HDMI to DVI cable can be essential if you wish to use an older DVI-only monitor with a PC which doesn't have a DVI output. It can also be used in reverse if you have a monitor with a HDMI input but a PC with only a DVI output. The cable has fully moulded connectors with gold-plated pins for maximum reliability and signal transfer. It is 1.8 metres long which is the most popular monitor cable length. 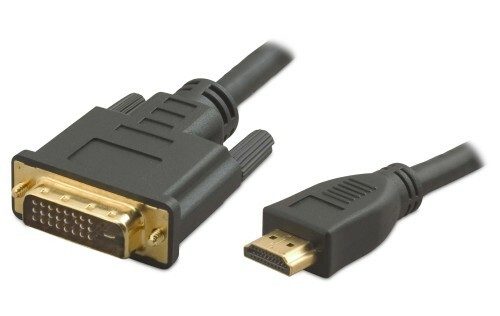 Please note that using DVI or HDMI will give a noticeably better picture quality than using an older-style 15-way D-Sub VGA cable, which is the other popular method of connecting legacy monitors to PCs or vice-versa. As an alternative to this cable, it is possible to use a HDMI to DVI adapter. However, we have experienced problems with using such adapters where they work fine at lower resolutions but when the resolution is increased, (e.g. Windows is started), only a black screen is shown. This is likely to be due to a degradation of the signal quality as it passes through the adapter and because the HDMI and DVI protocols are digital in nature, they either "work or they don't". As a result, we recommend using a specifically-designed cable like this one rather than an adapter.